We have travelled throughout the U.S. at almost every time of the year and this one we are taking today is in November, when there are many pretty fall colors to see. This being our first fall season in this area makes it all the more enjoyable to see the sights. We began our travels driving through the Okanagan in BC where the leaves have turned and which I have shared at other times. Click here. to see more of that. We are in the Okanogan County in Washington State, the valley which continues down from the Okanagan Valley in BC but has a different spelling. We are on Hwy 97 which follows the Okanagan River through the northern part of the state. We stay on Hwy 97 for most of our travels through Washington other than a jog onto I-82. We pass through quiet country with small towns sprinkled along the way. The terrain is so similar in both Okanagan Valleys and they are growing similar crops as the other, as well. The BC Okanagan was known for its’ fruit orchards as is the US Okanogan but BC seems to dominate with vineyards, as well. Both sides of the border have a long history as fruit growers. A nice calm spot on the Okanagan River reflects the hills and the orchard that borders the shoreline. This is so like seeing the Thompson River flowing into Kamloops Lake with very similar hills to reflect. There is no doubt we are following the same valley down, so far. We found a nice RV park just outside of Yakima for an overnight stay and saw this irrigation flume on our way out. This one is concrete whereas the only other ones I’ve seen were wooden and certainly never able to last as long as this was. Click here to see those ones. Mt Ranier is the highest mountain of the Cascade Range and although presently dormant, is one of the most dangerous volcanoes that could erupt. According to history, Captain George Vancouver named this after his friend Rear Admiral Peter Ranier but it was also known to be called Mt. Tacoma. The debate about the name was re-ignited when Mount McKinley went back to the original name of Denali in 2015. We are approaching the Columbia River where we cross the Sam Hill Memorial Bridge into Briggs Junction, Oregon. This part of the river was the location of “very bad rapid” mentioned in Lewis’ journal dated October 22, 1805, who was part of the Lewis and Clark expedition. Biggs Junction has a population of 50 and the main business is for refuelling at this junction of Hwy 84 and 97. We followed Hwy 97 which was taking us on the scenic byway, “Journey Through Time” and called the WW 11 Veterans Historic Highway, home of Army Camp Rufus, 1944-1945. It was a quiet stretch of road. This part was such a pretty stretch lined by the big trees with changing colors and cattle in the nearby fields. A nice drive on a country road. We’d been travelling Hwy 395 after leaving Carson City, Nevada and at heights of over 1800 m (6000 ft.) we were certainly surprised to see this sight as we came around the bend. Mono Lake is a shallow and saline soda lake formed a zillion years ago. The salt makes the lake alkaline and you can see some of the salt accumulated at the water’s edge. The lake is very huge and sits at an elevation of 1946 m (6383 ft). It provides a nesting habitat for two million migratory birds who come annually. We followed Hwy 395 the rest of our day and saw a few small towns along the way. 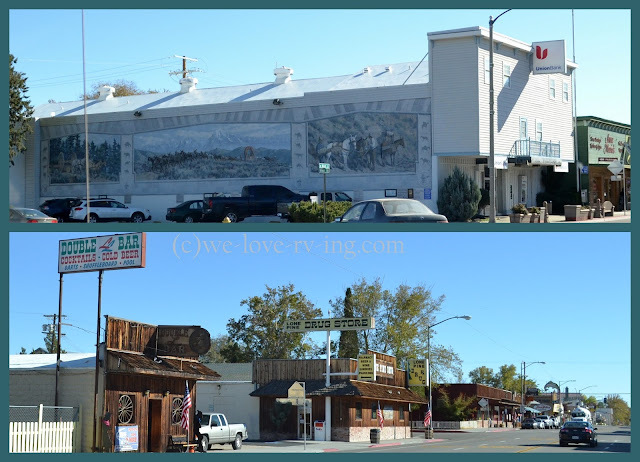 Bishop had the mural on the way and the other has what looks like the ‘real McCoy’ with the old western town storefronts. This trip was very different with quiet country roads and small towns to pass through. It makes for a nice change from the busy freeways that we often travel. It may take a bit longer this way but gives us the chance to enjoy some of the scenery. RV parks are quite easy to find and we had no snow to deal with in any of the mountain passes we drove through. It was a great trip. Really enjoyed this post! A road less travelled for sure. Interesting part of the country. Thanks,Karen. We sure enjoyed it, a very quiet and peaceful drive.